Different approaches to Brain-Computer Interfaces have been developed, each one with specific solutions that range from understanding and explaining cognitive functions over communicating with real and virtual environments by thought alone to real-time monitoring of cognitive states. The Advances in Neurotechnology Workshop presents an overview, in-depth tutorials and discussions on the latest research at all levels of Neurotechnology and BCI research. What is presented will cover invasive recording, semi-invasive ECoG, non-invasive EEG, non-invasive NIRS and fMRI measurement and potential combinations of the different methods. Additional focus will be devoted to advances in data analysis. The poster session following the tutorials will cross over into an open discussion space, smoothing discussions snacks. Following the workshop there will be a summerschool on selected topics in BCI and neurotechnology from September 20th to 28th. It has educational tutorials in the morning session (two tutorials of 2h each, held by internationally renowned researchers), and practical hand-ons sessions in the afternoon. The practical sessions are partly multi-track and will allow researchers in BCI/neurotechnology to complement their expertise in the interdisciplinary field. Take a look at our call for participation or go straight to our registration page. Slides uploaded The slides for our talks are being uploaded for the Workshop and the Summerschool. videolectures.net is currently in the works. Summer school programme added We now have a first schedule for our summer school. The registration for it will open soon. Programme updated with speakers The programme is still being worked on, but the general structure is there. Take a look at the Programme. 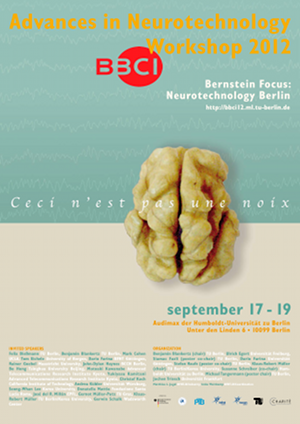 If you would like to put up the poster in your department, drop a note with your postal address to bbci12office@ml.tu-berlin.de .